Added 250 mL acetone to both flasks of TiO2. Sonicated both from 7:25 am to 7:35 am at 21°C to 24°C. Added ABS to both flasks and sonicated from 7:35 am at 24°C to 3:40 pm at 44°C. Both solutions had undissolved ABS fragments when poured into the pans. The 10% also had what look like TiO2 chunks as well. The 5% cast was heated on the usual hot plate set at 80°C. The 10% was set on a very low setting using an older hot plate with less control over temperature. Both were heated on the pans from 3:40 pm to 5:30 pm. The resulting 5% casting had some bubbles and a dime sized ABS chunk. There was a slight "leopard print" effect where it is believed TiO2 aggregated on the surface of the casting. 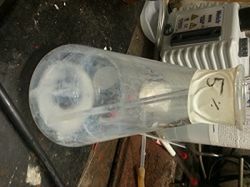 The 10% cast had lots of bubbles and holes where the acetone bioled away due to the higher heat. Also, major aggregation occurred on the surface of the casting. 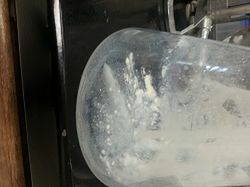 Figure 1: 5% solution after pouring into pan. The solution was relatively smooth and homogeneous. 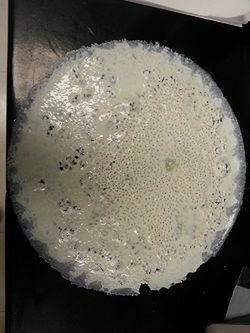 Figure 2: 10% solution after pouring into pan. Chunks of TiO2 can be seen on the bottom of the flask. No amount of scrapping with the stir rod would dislodge the chunks into the pan. Figure 3: 10% cast next day. The hotplate was so hot that the acetone boiled away very quickly, leaving the holes in the casting. Also, major aggregation was seen where the ABS and TiO2 completely separated out. This page was last edited on 27 September 2017, at 00:21.